Anyway, the story begins with the optimistic young Claude Lantier arriving in Paris to take it by storm. The art world was astir with the birth of Impressionism and the Paris Salon was exercising its power to humiliate the brash young artists who created strange ‘unfinished’ pictures of unheroic life. (You can read more about the battle between the conservatives and the innovators in Ross King’s The Judgement of Paris, see my review). Lantier doesn’t care: he is certain that ‘old’ art is dead and that the light-filled beauty of the new will sweep it away. But Lantier, first introduced to readers of the Rougon-Macquart cycle as a very young artist in The Belly of Paris (1873) and briefly alluded to as the son sent away to his uncle in Plassans in L’Assommoir (1877), is the son of Gervaise, as doomed as she is by her fatal flaws. (Click the links to see my reviews). * Guillemet is an artist now so obscure that he rates only a brief page at French Wikipedia, and apart from listing all the honours he was (so undeservedly) given and the (now forgotten) paintings that he exhibited at successive Salons, it mainly covers his role in having one of Cézanne’s paintings accepted by the Salon jury, of which he was a member. But the artwork which drew so much derision to Zola’s character Lantier is not attributable to Cézanne, it’s a close description of Manet’s striking Dejeuner sur l’Herbe (which you can see at Nancy’s commentary over at The Books of Émile Zola). While I enjoyed these ‘spot-the-painting’ moments, what interested me more was the struggle to create them, that is, to realise the artistic vision in the imagination with hand, eye, and paint. The confessional aspect of this novel comes in the character of Sandoz. 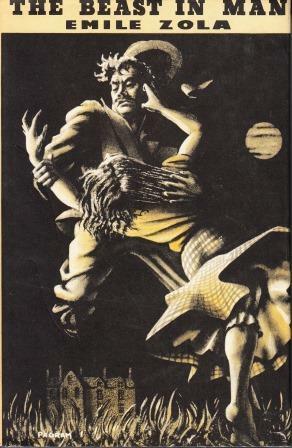 Clearly recognisable as Zola himself, Sandoz is determined to ignore the criticism and produce his series of novels, and he diligently sets about doing so. He works solidly as a journalist to pay his way and support his ailing mother, and as his fortunes rise by contrast with his struggling artist friends, he hosts ‘Thursday’ dinners as much to provide them with a decent meal as to enjoy their company. Sandoz shares Lantier’s ambition to do something new and to be acknowledged for it, but he differs in personality. His capacity for dogged persistence and to adapt when necessary is in marked contrast to Lantier’s fatal flaws, not least because he is willing to revisit and revise his own work whereas Lantier destroys his out of frustration and keeps having to start again. His quest for perfection dooms him in the end. The glorious artwork on the cover is a detail from Portrait of Frédéric Bazille, c. 1866, by Auguste Renoir. 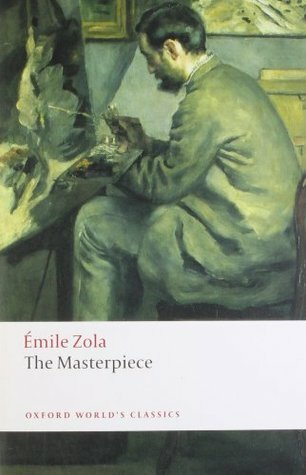 Bouquets to whoever chooses the artworks for the Oxford World’s Classics series of Zola’s novels, the choices are all just perfect for the titles they represent! Do read Arnold Bennett’s thoughts on The Masterpiece as well. L’Œuvre was first published in 1886 and has been translated as The Masterpiece. For images of other covers please look on the Images page.